Where to Find Twitter Drafts on iOS 8 iPhone / iPad? Where to Find Tweet / Twitter Drafts on iPhone / iPad? If, for some reason, your tweet is not sent Twitter saves it automatically in “Drafts”. So, where do we find the saved twitter drafts on iOS 8 for iPhone / iPad? It’s not easy to find. It happened to me when I tried to send a tweet but sending failed for some reason and Twitter notified me that my tweet had been saved in the drafts where I could try sending it again. For next 5 minutes, I was looking out for “drafts” where I could find my saved, unsent tweet. After searching through whole of Twitter for iOS app, I was finally able to find it. So I thought to post it here as it might help some of you. 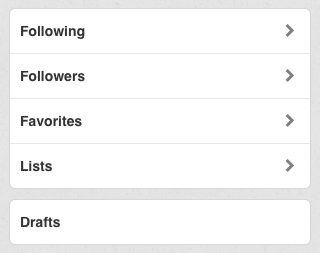 Scroll down to find “Drafts” … there it is. Tap on “Drafts” and you will see all the items saved in there. You can send all of them at once or one by one or can also delete them from there. It’s damn easy! The hardest part, of course, is to find “drafts”. Especially if you too, like me, thought it would be as easy as in Gmail, lessons learnt :).